The other day my Darlings, sad news spread across the horror community. One of the coolest people I, and many others, had the privilege of meeting passed away. Most know him as the first zombie in George Romero’s 1968 classic, Night of the Living Dead. I and many on the convention circuit knew him as a fine example of a human being. It was a great loss to us all, but I know he is in a better place. If there ever was a good place to go when we die, this man surely is allowed in. I could go on forever with how important his role was, what a great person he was, so on and so forth…instead I have a few words from people who met him…people that sat next to him…and people that partied with him. “I’m not going to pretend that Bill Hinzman and I were best friends. We didn’t spend Thanksgiving together. I wasn’t a set designer for “The Majorettes”. All I am is someone who had the opportunity to meet the man and I am grateful that I did. Some might only know Bill Hinzman as the “graveyard zombie” from Night of the Living Dead. There are many who didn’t know his name. They have never seen “Flesheater” or “Children of the Living Dead”. And that is fair since, let’s be honest, neither one of those 2 films are going to win any Oscars. So, why are so many feeling the loss of this man? Simply put, Bill was the perfect example of what horror fans (and all movie fans) want their icons to be. He appreciated his fans just as much as his fans appreciated him. You always felt that he was just as happy to meet you as you were to meet him. He made it feel more than just a photo-op. When in his zombie make-up, he WAS the “graveyard zombie”. It was as if he stopped chasing Barbara through the headstones, stepped off of the black & white screen, and now he was in the viewfinder of your camera “coming to get you”. Isn’t that why we watch these films? To become just a small part of it, if even for just a moment. “The very first time I laid eyes on Bill Hinzman it was the middle of the night. I was about 8 years old as he shambled through my living room, attacked a young woman by the name of Barbara and killed her brother in a scuffle that unfolded before my eyes. My life…would never be the same. Bill Hinzman changed made an immeasurable impact on me that night. He terrified me, he intimidated me, his living dead personae fascinated me. No other living dead descendant of Hinzman’s Ghoul #1 is etched into my memory the way his is. Sure, George Romero and John Russo wrote the modern zombie, but it was Hinzman, who truly pioneered and crafted it onscreen in his now legendary performance in Night of the Living Dead. Fast forward over a decade and I am in line to finally meet the ghoul who rattled me through my television set as a youngster. My stomach is in knots, I’m getting anxious. Bill is now amongst my very first horror film celebrities I was to meet. My turn comes up, I step forward, and there before me is the smiling, sweet face of Bill Hinzman. I reached out my hand to shake his and introduced myself, “Oh man, hey, eh, my name’s Kevin. It’s a real honor to meet you, Mr. Hinzman!” In return, Bill shakes my hand and says, “Good to know you, Kevin. You can just call me Bill.” And that’s how I first got to know Bill. I would like to tell you a story about Bill… Back in 2008, that was a rough year for the Psychotik family. I lost two people very dear to my heart, I lost my car, I lost my job, lost my home….It was a rough time to bring a child into the world. We had just started pulling things back together, and decided to take a trip to Spooky Empire’s Ultimate Horror Weekend. We had went the two years prior, and it was always good seeing friends and hanging out. That Friday night, I had a bit too much to drink and had a seat in one of the pool chairs. The man who sat next to me was none other than Bill Hinzman. I talked to him for a good little bit, telling him all sorts of things you never tell strangers…and he listened. I told him how i didn’t know where I was going in life…that I put everything on “Have to get to the Con” and now I’m here and don’t know what to do. I didn’t know what to do with my life. You know what he told me? He said, “Sometimes it’s not important to know where your going. Sometimes you just have to do what you think is right and see where it takes you. Either way, I’m sure you’ll end up right where you need to be.” I’ll never forget those words. This entry was posted on February 13, 2012 by malicepsychotik. It was filed under Psychotik News Asylum! 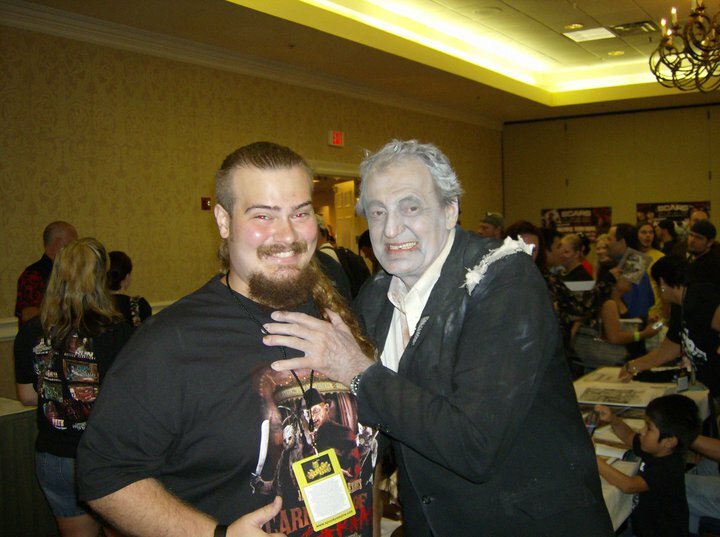 and was tagged with Bill Hinzman, Dead, Death, Ghoul, Night of the Living Dead, Zombie.